President of Ukraine Petro Poroshenko, during a meeting with Minister for Environment, Minister for Jerusalem and Heritage of the State of Israel Zeev Elkin, has discussed the development of trade and economic cooperation between the two countries, and called for resolving the existing difficulties with admission of Ukrainian citizens to Israeli territory. 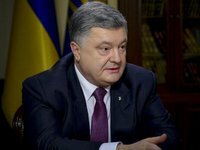 "The president of Ukraine noted the concern over the existing facts of the inadmissibility of Ukrainian citizens on the territory of Israel, despite the existence of a visa-free travel regime for citizens of both states. He called on the Israeli side to take all possible measures to improve the situation in this area," the press service of the Ukrainian president said on Tuesday evening. Poroshenko also noted the intensification of the political dialogue with Israel and expressed hope for its further continuation. "The two discussed intensive trade and economic cooperation between the two countries and noted significant prospects for further development. In this connection they agreed on the need to sign the Free Trade Agreement between Ukraine and Israel as soon as possible," the message says. The president of Ukraine also discussed with the minister, who is the co-chair of the Israeli part of the Joint Ukrainian-Israeli Commission on Trade and Economic Cooperation, the results of its recent meeting, which took place in June.